Segan is a desert world with a thin atmosphere. The system has a population over one billion. This world designated as an Amber Zone. Caution is advised since the world has an environment, laws, customs, life forms, or other conditions that are not well understood and might be a danger to a visitor. 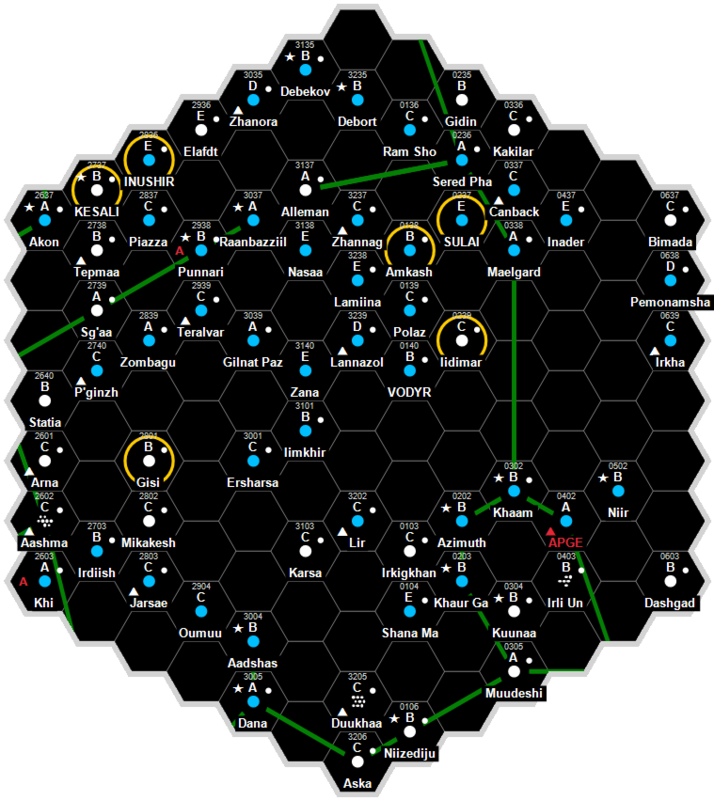 It is a client state of Third Imperium in the Atsah Subsector of Deneb Sector. This world has a nearby Naval Base, capable of handling warships. This is the homeworld to Segani, a Minor Race, Minor Non-Human Race. Segan has both an unbreathable thin atmosphere and a lack of surface water making habitation by sophonts difficult. The system has a population between 10,000 and 10 million, lacking the industrial base to be completely self-supporting. It is a member of Wilds in the Atsah Subsector of Deneb Sector. This is the homeworld to Segani, a Minor Race, Minor Non-Human Race. It is the homeworld of the Segani, a sophontic species and minor race. Segan is a hot planet with two moons, one orbit inward from the habitable zone. The Lurent planetoid ships may be found in the system’s Oort clouds. With 5 billion inhabitants, it is the most populated world in the subsector. About 30% of the population are Vargr, and Segan is the fief of the Segae Clan. Some 400 million humans are found in underground cities, clustered near the starport. These cities are fitted with completely independent, closed ecologies. The remainder of the population are a local Sophont people referred to as Segani. Segan's current ruler, Gishma Parimesha, is admired both for her personality and her administrative ability. She wields most of the powers of government personally but delegates enough authority to her subordinates to quiet any minor grumbling. The law level of 11 seems oppressive to outsiders, but pleases the orderly, quiet-tempered Seganites. This page was last modified on 19 November 2016, at 08:59.